When you drive around Big Sky Country, you're bound to see a few horses around. They may be at stables, trailheads, or grazing in peaceful meadows. These horses are a part of the Big Sky community and are big part of life in Montana. Come for a visit and you'll see what we're talking about. Horseback riding in Big Sky, Montana is an experience of a lifetime. There's something very western about riding a reliable steed deep into the Gallatin Range or Madison Range. When you look at a map of Big Sky Country, the terrain seems endless. Riding a horse through this jaw dropping world is something that you need to add to your bucket list. Pack trips, trail rides, and big game hunts are an excellent way to venture into some of the most remote areas of the Gallatin National Forest and the Lee Metcalf Wilderness. Trips leave daily to places like Hilgard Basin, Bear Basin, Koch Basin, Spanish Creek, and other amazing areas near Big Sky. You can even arrange to ride horses in and around Yellowstone National Park! Big Sky is a horse riding paradise. 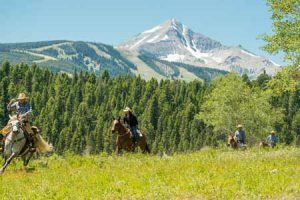 All levels of rider can enjoy half day, full day, or overnight horseback riding trips in Big Sky. 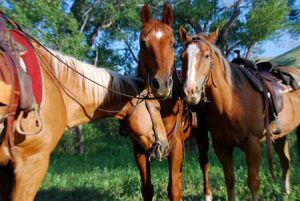 Logging a few hours in the saddle with a trustworthy horse and an experience wrangler may be the ultimate wilderness experience. Montana Whitewater Rafting & ZipLine Co.
Be sure to book your trip to go horseback riding in Big Sky ASAP. It's a popular activity and these businesses get busy quickly. Reserve your slot today. Add in a chuckwagon dinner, rafting, zip lining or fishing and you'll have a day to remember! 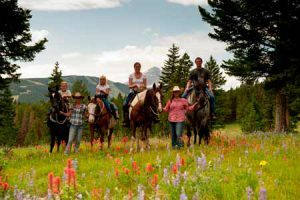 Or better yet, stay at one of the guest ranches near Big Sky for the ultimate western frontier experience. Horseback riding is a unique and fun way to explore Big Sky's backyard year round. Are you ready to go horseback riding in Big Sky?